Due to the tactical and technical evolution of the game of Futsal a team must find an adequate way to break down the opposition. 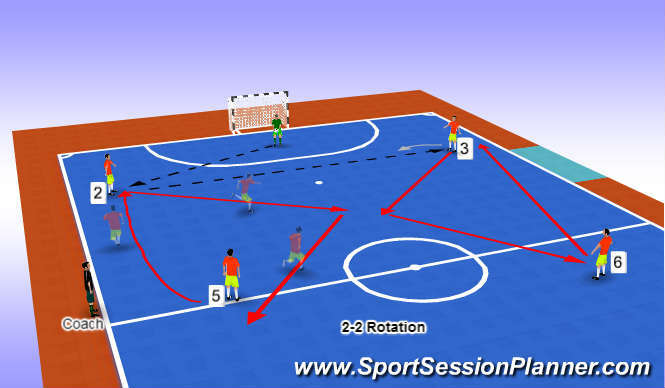 Rotation and player movement is a part of the principles of play to create support/ space and time. By creating width in a 2-2 formation it creates a channel in the center of the court, this space allows us to look to break the lines as well as play between lines to penetrate the opponent. Constant ball circulation and player movement creates fatigue to the opposition which in turn creates mental focus break down or in disciplined in their defensive responsibilities which allows you to break down the opponent in attempts to create goal scoring opportunities. Objective: Ball start with the goalie and looks to roll the ball into either L or R Defender. Start this Rotation without a defending team. Player 2 receives the roll out from the goalie and plays a ball into 3, immediately 2 makes an attacking diagonal run through the middle, 5 looks to interchange and drop into the space left by 2. Once 3 Receives he must assess can I play a penetrating pass into 2 for a break out? If the pass isn't on he will play pass back into the space which has now been filled by 5. If 3 plays pass into 5, player 3 makes a diagonal run into the middle as like did player 2, Run is central then out to switch into position with 6. Once player 3 has made the attacking run 6 must drop in to the space creating the width required to attack in drop into 3's previous position.